Indipendent small house inside a restored hamlet "Badia di Sopra". Close 2km from Loro Ciuffenna. The house is located next to the main owner villa, have one bedroom with doublebed, one bathroom, living room with sofa, kitchen and a space outside with table and chairs. 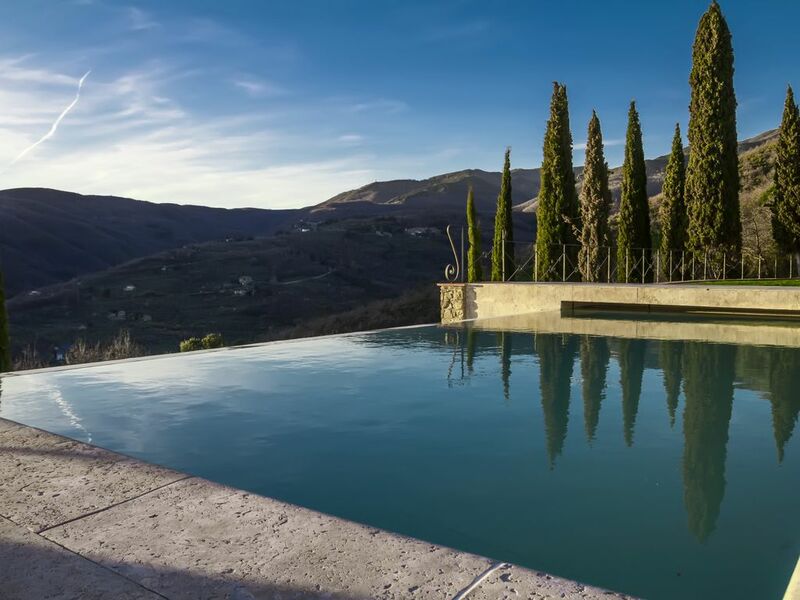 Inside the property there are an magnificent infinity pool, with great views of valley and sorroundings, well manteined gardens, walking paths, some fruits trees and a fenced parking. All the "Badia di Sopra" hamlet was for longer time just old forgotten ruins. The swiss Strasser family during a holiday in Loro Ciuffenna loved the position and the views of that ruins, then he decided to buy it and make a great restructuration of the old village. This is was possible with help of "Accademia delle belle Arti" italian institution for the protection the artistic heritage, and Piero Giusti, a building contractor, one of the most famous and talented of the area. The Accademia made the hard work to identify and enumerate all the stones, and forced the owner to rebuild in the same location and in the same sizes, the village that was. The most memorable visit of our trip! The most unbelievable experience in a breathtaking property with everything you would ever need. The host and owner of the estate was the nicest lady in the world and made us feel right at home with some welcome prosecco, melon, and meats, gave us a fresh fruit basket, water and olive oil (from their trees). The room itself was spacious, super clean and had everything we needed to cook up meals each night. High atop the hill, you have an amazing view and the pool is an amazing addition to relax and cool off. Cannot recommend this place enough. We absolutely loved it here-it’s a little piece of heaven. Heidi who owns the property is a fantastic host and nothing was too much trouble. Views are stunning from every direction. The units (3) all have their own character, spacious and are immaculate with everything that you’d need for your stay. The pool and the gardens are stunning and relaxing was easy on fab lounging chairs. Missing it already and would come back in a heartbeat. This place is a must. We had an amazing and memorable stay at this beautiful property. The location is very quiet and has views to die for! This recently converted monastery has been finished to an extremely high standard and the attention to detail is excellent. We had a fabulous welcome by the owners and enjoyed our time here very much. Easy access to Arezzo, Florence and Siena. Thank you! Florian and Heidi are very lovely people and caring hosts. The property was a monks hamlet and hillside orchard in the 1800's. It has been rebuilt preserving its historical architecture with the addition of all of today's technology and amenities. The location and views are exceptional affording guests a variety of local day trips, restaurants and quintessential Tuscany sights to see. We stayed there a full month and left feeling it went too fast. There are three rental units surrounding the main house, pool and spa. Each unit has both privacy and terrace views overlooking the valley taking advantage of their dramatic elevations from sunrise to sunset. Highly recommend to all. Auf unserer Rundreise durch die Toskana haben wir ein paar Nächte bei Heidi in Ihrem tollen Anwesen verbringen dürfen und wollten anschließend überhaupt nicht mehr weg. Die Ferienwohnung ist mit sehr viel Liebe zum Detail eingerichtet und es hat an nichts gefehlt. Das Bett ist anders als erwartet für italienische Verhältnisse sehr gemütlich und sorgte für einen angenehmen und erholsamen Schlaf. Und über den Pool und die Außenanlage müssen wir nicht reden; die Bilder sprechen für sich!! Wenn man Ruhe sucht und die Landschaft genießen möchte ist man hier genau richtig. Heidi war uns eine wundervolle Gastgeberin und wir kommen definitiv wieder! Quel endroit où respirent calme, sérénité, sourire et convivialité en arrivant puis tout au long du séjour. Endroit idéal pour visiter la région d'Arezzo et plus dans des paysages de toute beauté sans oublier les lumières toujours surprenantes du ciel de Toscane. Que du plaisir dans cette demeure où il fait bon vivre si vous recherchez la tranquilité.